The Bernard van Leer Foundation is proud to be a founding member of the Moving Minds Alliance, which launches today. Moving Minds is a funders collaborative and network convened to scale up coverage, quality, and financing of support for young children and families affected by crisis and displacement. Drawing from on-the-ground experience and shared learning, Moving Minds seeks to catalyse a new way of responding to emergencies so that families caught up in crisis are able to rebuild resilience and foster the well-being and development of their young children. More than 10 million infants and young children affected by crisis and displacement are not getting the support they need to rebuild resilience and reach their full potential. Despite the enormous need and high cost of inaction, early childhood services remain overlooked and underfunded in emergency and host country contexts. Forced displacement worldwide is at a record high, and children are disproportionately represented among those fleeing from emergencies and conflict-affected contexts. The UN Refugee Agency reported 67.75 million displaced people in 2016 – more than 10 million (16%) of these are children under the age of 5. The protracted nature of modern displacement means that many of the youngest refugees* will spend their entire childhoods in displaced contexts. Young children living through conflict, disaster and forced migration are at high risk for psychological trauma and toxic stress – experiences that can impair their immediate health, learning, and socio-emotional development. The good news is that poor developmental outcomes for children growing up in crisis are not inevitable – children are remarkably resilient. Quality, integrated services for young children and families can save lives and mitigate the destabilizing effects of trauma and displacement. But implementation of these solutions is severely lacking in humanitarian and host country contexts alike. A lack of early childhood services and programming with a focus on responsive care-giving and early learning can have a negative impact on future generations, reinforce inequality, and threaten the peace and stability of societies in the long term. 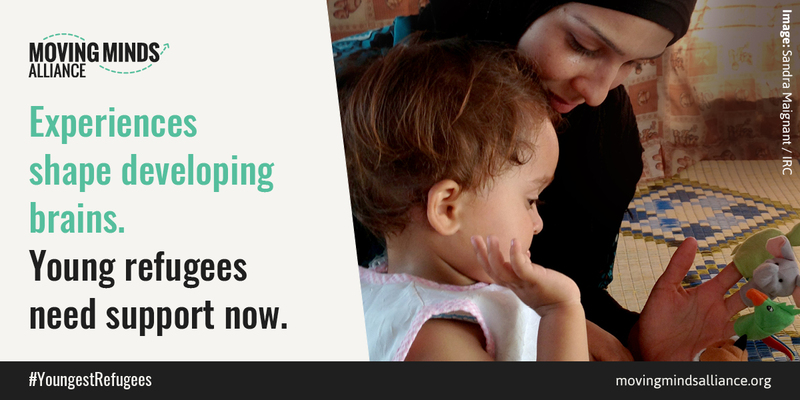 The staggering number of young children affected calls for urgent action at all levels. The Moving Minds Alliance has come together to champion the needs of the youngest refugees globally, and to catalyse action and investment. To learn more, visit movingmindsalliance.org.